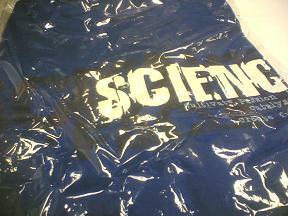 Yongmin & i actually bought the science faculty t-shirt! Yongmin: "hey, let's buy the science faculty t-shirt lei." Yongmin: "it's only 4 bucks! can wear it to sleep!" & do you know what's the latest, coolest, trendiest way of submittin' assignments these days? 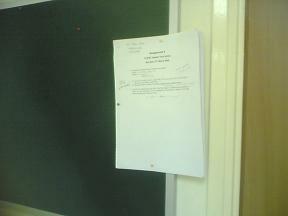 we actually PINNED our assignments on the noticeboard outside our lecturer's office! so NOTICEABLE on the NOTICE board! soon-to-become VIP members of new zealand natural & spinelli, as we drink their stuff every other day! tryin' so hard to stay awake durin' lectures (not cos we wanna understand the lesson), it's so as not to be the one treatin' lunch later! we even overslept today! omg. thanks to a call that woke me up, if not we could have missed the entire lecture! out of school would be - the tuesday half-priced waffles @ gelare & movies! but i would say, i have enjoyed most bits of it! so both the males & females survived! shi mei! hahah.. like i am some kind of gongfu master siah, lolx. mexican weddin'? 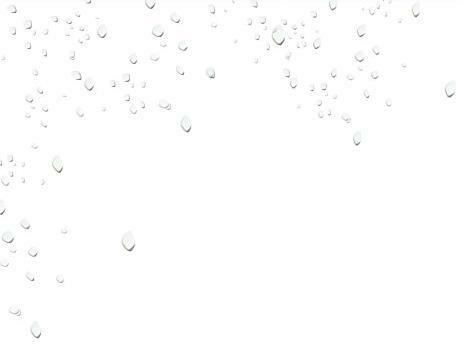 a drink? sounds cute! hoho. when i didn't do any bit of my homework?!? i need to find a job la! 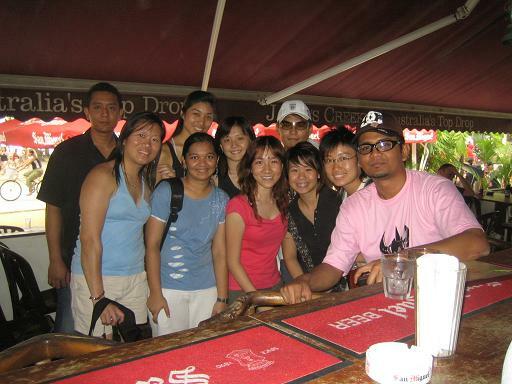 this time with a lot more people - Fisher, Raymond, Joanne, Kai Feng, Anthony, Seeto, Shubas, Adam, Gaurab! argh, & they wanted us to bring our laptops with flash INSTALLED! worked the dinner shift at spageddies! went for supper at kopitiam @ youth park with ZQ (Zhen Quan), Alvin, QH (Qian Hua), Kai Feng! someone please call the SPCA! look at what my meanie friend, Reithna did to poor chicken little! 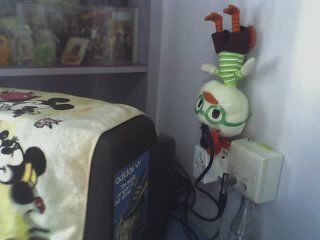 she used chicken little to stablise her loose tv plug so that she could watch tv! had so much caffeine today! 2 cups of spinelli's vanilla latte + new zealand natural's espresso shake! the categorical data analysis test was..
haha, in a good sense! this year - IT IS MINE! cos u live in a bigger house & u are more well-off than me obviously! & I KNOW NUTS ABOUT IT! & HOST for the dinner shift! most customers were nice today! if you're nice to me, i'll be very nice to you! that's when the fun begins! so Yongmin & i could skip them! 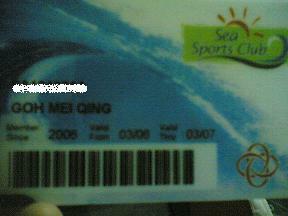 sea sports club membership card! have your first impressions of people been accurate so far in life? your initial judgement, perception of someone - are they still the same now? for me, NOT AT ALL! we would be sms-ing each other & even chattin' on msn! when i first met you, i would have never imagined we would be like how we are today! overdued photo! rollerbladin' with the munchie monkeys @ east coast park last sunday! crashed the whole table39 over while walkin' past it! "wow, you're so pro lo, can balance so many plates in your hand." "your desserts are comin' from italy or what?" that you wish you could learn? hopin' to know/learn all these before i step into my grave! i have a rottin' 7-month old drivin' licence. rottin' in the sense that i hardly drive! i am also quite a directions-idiot, always takin' the wrong buses, the long routes. maybe i should start with knowin' the CTE, BKE, PIE? be it web-designin', poster designin', interior designin', i wish i have the creativity to design! it'll be so cool to see your artwork bein' recognised & utilised. also wish i'm proficient in adobe photoshop, macromaedia flash, dreamweaver, whatever! MUSIC IS MY LIFE. i wish i can do somethin' related to it in future, but sadly, it is hardly possible. anyway, instead of only able to listen, hum, sing-a-long, appreciate and relate to others' songs, why not create my own? spin my own tune, write my own lyrics and music! ah, juz wish i can compose and arrange music. but wait, how many strings are there in a guitar? this is quite a weird dream ya? oh well, how nice if i can have the stamina to run a marathon, without any aches, pains or diarrhoea after it, haha. yeah, public speakin', known to be the greatest fear among people, even more than death? i remember we used to do it in secondary school. i memorised my script till i could say it backwards. but i ended up speakin' at the speed of a bullet train, along with the tempo of my heartbeat. this needs practice and trainin' i guess. helps in writin' music! haha. & piano has such mellow tones, good for easy listenin'. most sentimental songs are sentimental cos of their piano segments. piano is such a romantic instrument. i wanna coordinate all my 10 fingers too! this is somethin' that i never understood. though tv shows a lot of it. what blue-chips? why plunge? what wall street? what index? what are shares to begin with? sarang-heyo means i love you. haha. it'll be good to know another language. but my english & chinese are both not anywhere there yet too. oops. so there were no lessons at all! it was the first time that Seok Chuan, Liping & i worked a same shift together! people comin' from snoopy place have casherin' skills naturally? in contrast, i was quite pleased with my design & analysis of experiments test results - 25/30!!! i believe they'll bring munchie monkey to greater heights! right after the sea sports camp, god. munchie monkey is sellin' yummy cakes! check out our cake counter! did i blade with my arms yesterday? my arms are achin' & not my legs! 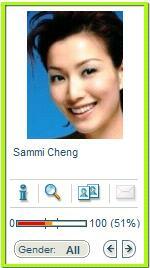 my resemblance with sammi cheng is 51%! 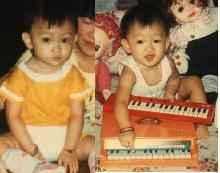 hoho.. who do you look like? piglet? haha.. shoOoOo cute. all of them could blade! EXCEPT ME! worked the dinner shift spageddies! sold only 3 cheese fondues, boo! have you learned to smile again? hmmx, where has the crowd gone to? & 7 durin' the dinner shift! hey liangcai!! thanks thanks, for your help for the past year too! we went to watch underworld: evolution @ cineleisure after school! 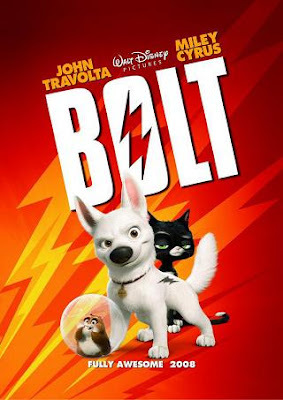 but the female lead, kate beckinsale is kidda good-lookin'! haven't worked for 3 days there! gotton my nametag for my uniform! 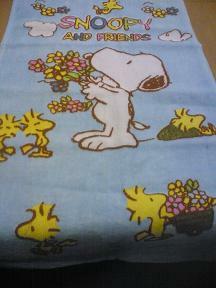 this is the CUTE hand towel that Yongmin gave me! heex. 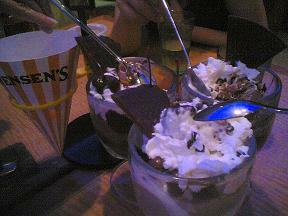 the desserts Wei Wei, Seok Chuan & i had at swenson's! ya lo..many people also told me it's not true at all, haha..
it really ain't easy bein' a singer! "all of our officers are busy at the moment, your call is important to us, please hold while our next available officer will get to you shortly." & i didn't have to work today! met up with Wei Wei & Seok Chuan! & did our favourite thing - KTV!!! had a free vanilla latte from Yongmin! one word could describe my day - WORK. 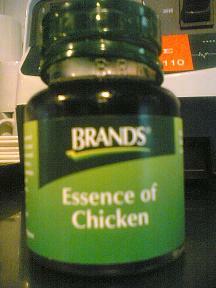 Huiying brought me a bottle of chicken essence! i sold 5 fondues last night, remember? in the end? i sold 15 fondues!!! 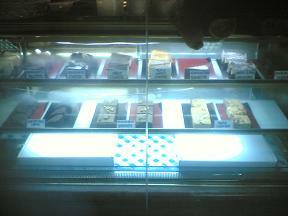 i was entitled to 5 free desserts, hoho! the feelin' is becomin' more & more similar to those times when i was sellin' the snoopy P.A.L. cards! skipped the new media lecture! cos it's about the introduction to statistics! wahaha, why would a statistics major student attend? it's another crazy cheese fondue night at spageddies! & we were sellin' cheese fondue like crazy! 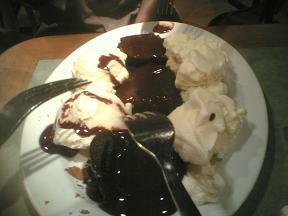 eventually, everyone in our station was entitled to a free dessert after work! haven't worked at a station for so long! I WORK DOUBLE THE HOURS I SPEND IN SCHOOL! & school is juz 20hrs per week! 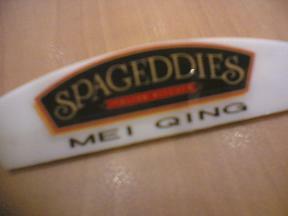 not at spageddies, not at munchie monkey too! A REVIEW OF THE JJ ALBUM! Review:: a really soothin' ballad, love it lots! a great start to the album, heex. tryin' to be involved in the korean wave? Review:: the 主打! i love the piano! a nice mix of piano with rock. quite a heavy song; it really makes an impact! Review:: the chinese version of down! very easy-listenin' track. Review:: a fast song, catchy, energetic. but not my kind of song! Review:: one of my favourite tracks! great lyrics. sobx. Review:: love the flute intro! this song has a new age feel to it. touchin' lyrics. Review:: this song is similar to 豆浆油条, describin' love as some kind of food! so sweet. Review:: WOOHOO. the best song in the album, i would say. though this is not my usual sappy love song, this song rocks! the violin, the xylophone! i love the variations in this song, so excitin'! especially the middle of the song, with juz the drums & breathin' sound, wootx. Review:: what a sad song. boohoo. Review:: the most heart-breakin' song in the album. -ouch- from the title, you know what's this song about, sighx. the music sounds a little like 简简单单. Review:: the most cheerful song in the album. it's the theme song for channel u apparently. Review:: the english version of 熟能生巧. the lyrics say a totally different story from the chinese version. prefer this english version! saw Platonic for the first time! then headed for a quick SWIM! 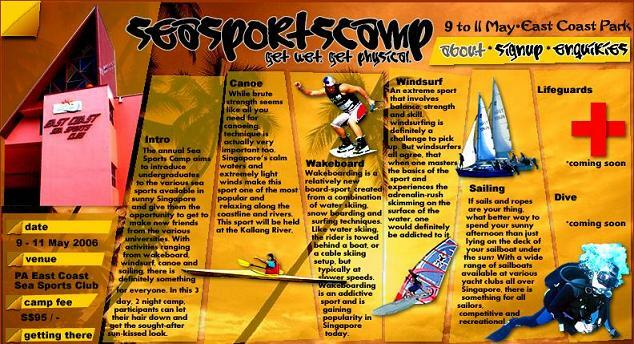 will be joinin' NUS sea sports camp 2006 (9 may-11 may) with Vivi! will get to try canoein', wakeboardin', windsurfin', sailin' & maybe even lifeguard skills! ah. what's up with me? realised i hadn't been payin' attention the past few lessons! went mac @ engineerin' for BIG breakfast! but i'll need at least $3k! 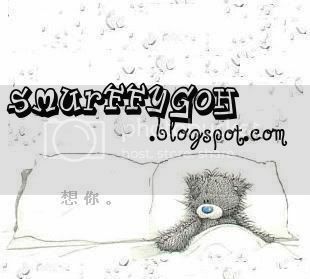 munchie monkey was freakin' stuffy! 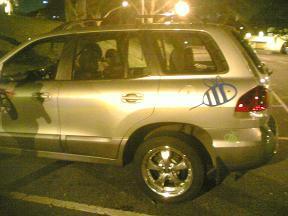 the dishwasher uncle gave Isabella, Amanda, Huiying & me a lift! the uncle's car! woohoo, rich man! featurin' AMANDA's shadow on the left! i've been sleepin' through it for weeks! earned myself a free dessert for sellin' 3 ala-carte cheese fondue! what's more, there are incentives! even if that means i'd drown. woke up with an ACHIN' body! but i muz mention this - I LOST MY EZ-LINK CARD AGAIN. & i lost it AGAIN. went for windsurfin' course day 2! then we went out to the waters! managed to sail a little! i've gotton my windsurfin' proficiency level 1 card! waitin' for the sea sports club membership card to be mailed to my house! the front & back of the card! 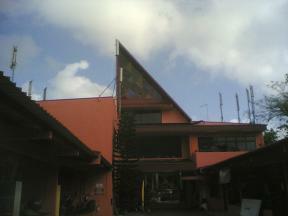 east coast sea sports club is such damn ulu place! this really ulu place, but i've cycled past before! had my first windsurfin' lesson! then finally, out to the sea! oh man. what a tough sport to do! good old snoopy days, sighx. & it was BUSY LIKE HELL. hoho, but Seok Chuan is back! & tonight was THE night! with her help, i managed to close the cashier really fast! miss my baobei Vivi a lot! haven't met her at all since the start of 2006! 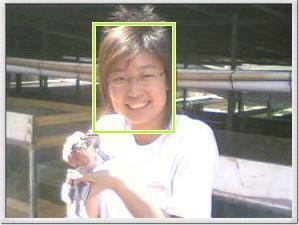 she has graduated from ngee ann poly already! we had chosen to do a data analysis project instead of havin' another mid-term test! what a waste of our time! then, Yongmin realised he lost his ez-link card! we went to the career fair @ MPSH! Yongmin treated me to a drink from new zealand natural! which means, i was the runner! Amber, Joycelyn, Anthony, Jon, David, Adam, Seeto! GRADUATIN' - CHEER OR BOO? they suddenly have nothin' on at all! who will prefer workin' to clubbin'?